Joe Devin proved himself to be a Bobcat killer. Devin finished the series scoring four of the Big Red’s five goals. 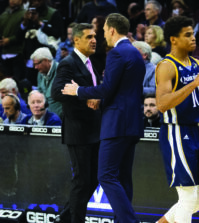 The loss marks the fourth straight year that the Bobcats bowed out in the ECAC quarterfinals. The Bobcats fell to Union (2010), St. Lawrence (2009), and Harvard (2008) in previous years. 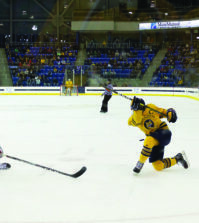 It was a rollercoaster game for Quinnipiac, who trailed 2-0 until the eighth minute of the third period, when junior captain Scott Zurevinski batted in a goal to cut the Big Red lead to one. Yuri Bouharevich tied the game up five minutes later. Devin, though, had the last laugh. The senior put home a pass from Sean Whitney 10 minutes into the overtime period to push the Big Red onto the ECAC semifinals. Patrick Kennedy opened the scoring 3:13 into the first period with a power-play goal, and Devin scored Cornell’s second goal 12 minutes into the second. Quinnipiac was 0-12 on the power play in the series.